The inaugural 2012 Gaon Chart K-Pop Awards was held at Blue Square in Hannam-dong, Seoul on February 22, 2012. Stars like Beast, B1A4, IU, Super Junior, Wonder Girls and many more attended the award show. 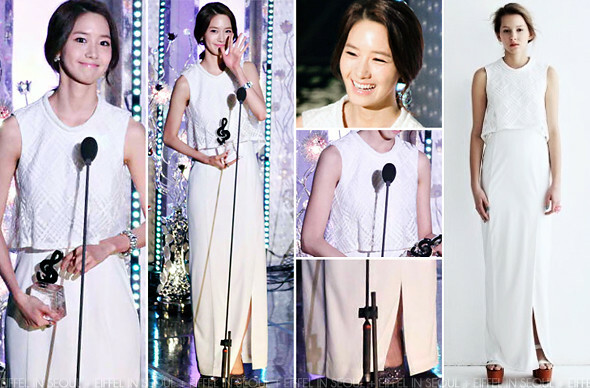 Yoona (윤아) was present to receive the 'Album Of The Year' award on behalf of Girls' Generation. She opted for a white floor-length gown from Eryn Brinié. She accessorized her look with simple jewellery and a pair of glitter pumps. Lovely outfit but she definitely needs to put on some weight. Even the model looks better than her.